I often times think back to 8th grade and my math teacher, Mr. Hutchinson. At this point I wasn’t a very strong student or mathematician. This didn’t deter Mr. Hutchinson. He pushed me in ways that I hadn’t encountered previously. It is hard to define a single action that led to my success but I remember feeling supported and was held accountable for my own learning. This accountability piece was a backbone of how I was raised that when utilized in the classroom, it just fit. Having taught math for the past decade, I spent much of my time focusing on the pedagogical and content areas of the subject. As a teacher and curriculum designer within Oakland Unified, the way that students understood and applied knowledge in mathematics was key. This curriculum, which was used district wide was centered around students using discourse as they investigated and developed skills in small, cooperative groups. As I transitioned from this position to my current placement in an alternative high school in Portland, my pedagogical toolkit needed additional resources to be successful. Some of the new challenges faced were infrequent attendance, large skill gaps and a reluctancy to buy into a system that hadn’t proven itself to work for these individuals. Last year, I developed sets of self contained units to allow students to work at their own pace and skill level within the same class. Students would self-select a small group or work individually to complete the given unit. This system worked but lacked true accessibility that our students needed. Google Classroom presented itself as a platform where units and lessons could be posted and students could access the content inside and outside the classroom. This is where Touro’s Innovative Learning program with a focus on TPACK came to play a huge role in my development as a teacher. Leveraging technology to meet the needs of each individual student who comes through our doors is not only helping each student learn and work towards a diploma but is developing 21st Century skills that will be needed as they enter the workforce or post secondary education. ​Oakland's district math team helped shaped the way I viewed education, especially math education. The Team Math Collaborative was in charge of designing and implementing a curriculum that relied upon student discourse, investigations and exploration. Foundational skills were supported through the use of number routines such as Number Talks, where students could share the way that they made sense of numeracy not what was dictated to them. This is where I got my chops. In the classroom I was free to act as a facilitator rather than the lone keeper of information. In this model, I relied little on technology (not to say it wouldn't have made my structure even better). Moving to another district, into an alternative program, changed much for me. No longer did I have the consistency in attendance to build up cooperative groups or a class wide movement though the curriculum. Individualizing education for each student was not only a support but a necessity. With a constant influx of new students, varying levels of prior knowledge and spotty attendance, I needed another way to think about math education. Turning my previously designed curriculum into a more scaffolded individual endeavor worked. Since the class sizes were small, I could bounce around and support each student as they needed it. If a student missed several days or weeks, when they came back they could pick up where they left off. It was exhausting, but results were good, students were learning. This experience led me to think more and more about integrating technology to help meet the students needs on an individual basis. First a spreadsheet tracker was developed to monitor students understanding of specific standards as they worked through the units. Next came organizing the trackers and assignments into Google Classroom. The Touro Innovative Learning program helped support and push me as an educator to begin to merge curriculum, pedagogy and technology (TPACK). This level of integration has led to students using various tech tools to create and design using their voice, writings, videos and presentations. Students were gaining experience becoming independent learners through the use of screencasts, instructional videos, hyperdocs and other resources. As I wrap of the 2018-19 school year, I am in a place where TPACK is becoming more and more fluid within the classroom. For each lesson or unit I am gaining fluency in being able to select the right tool for the job and put the learning into the students hands. I cannot begin to tell you how excited I am to see how this understanding plays out next year. More to come! This TPACK journey has been invigorating to say the least. The timing of my enrollment in the Innovative Learning Program could not have come at a more opportune time. As our site transitioned to a PBL design, I was able to complete an Action Research on the effects of this design on content and collaboration skills. This research ultimately led me to the realization that in order for our site to meet the needs of our student population, scaffolds needed to be heavily in place to support our student attendance. Incorporating technology and specifically HyperDocs allowed me to design units that not only would deliver content and 21st Century skills, it offered students the independence needed for our population. As I plan for next year, the interconnectedness of TPACK becomes more fluid in design and allows me to differentiate and foster the learner in everyone. I am excited for what will become of my teaching practice with a now larger toolkit! 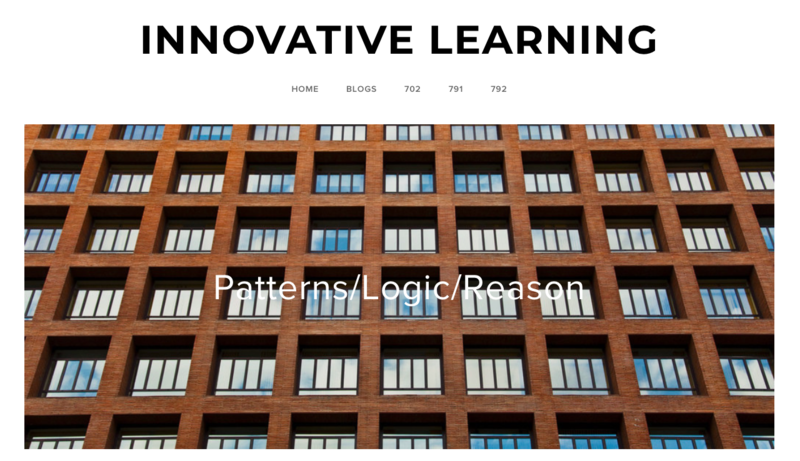 Writings about my journey through the Innovative Learning program at Touro University. Master's Website, including blogs, resources, assignments and design.